A single burnished leaf from the burr oak in the front yard floats down and comes to rest in the pot of yellow “mums” on the threshold of the little blue house in the village. Nights are cooling down, and it will not be long until we have to carry the pot indoors every evening as darkness falls and the wind rises. As the oak leaf makes itself comfortable among our potted blooms, a long v-shaped skein of geese passes overhead. Above the wedge of high-flying geese and slightly to their right, the waxing moon is translucent in the evening sky. The swallows of summer are packing their bags and making ready to leave, their places on telephone wires to be taken by hosts of chirruping sparrows and chatterings of ebullient starlings who are putting on winter stars and flashing their yellow beaks. 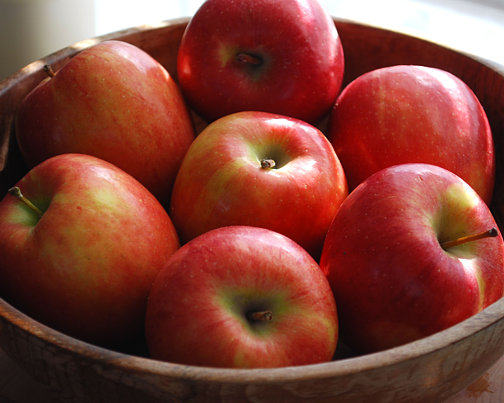 The first McIntosh apples of the year have appeared at farm gates, and several “Macs” rest flushed and rosy in a bowl on the kitchen counter. We carried a lovely big brown paper bag of apples home from a local orchard a few days ago. Most are destined for eating, but later there will be applesauce and pies, perhaps a few jars of cinnamon scented apple butter too. No doubt about it—Lady Autumn is standing outside our gate, and she is rattling the rusty latch vigorously. The lady knows the magic words that will grant her entrance, and she knows the tune that goes with them. I'm most keen to welcome her in (she's my favourite Season! ), but the UK is in the middle of a mad, late Indian Summer! I'm ready for mists and mellow fruitfulness, but I'm covering myself in sunscreen!! Beautiful post! I find myself re-reading it and getting in the spirit of the season!